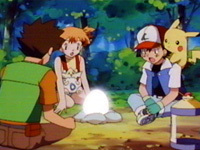 Japanese Episode 230: "Tamago, Kaeru"
English Episode 521: "Hatching a Plan"
Satoshi-tachi are eagerly awaiting the hatching of the egg they won at the Pokemon Ride. The egg starts to glow, and after a few moments it hatches and reveals the identity of the pokemon inside--it's a Gomazou! Before the little elephant can get to know everyone, the Rocket-Dan come in and try to capture it. Pikachu sends them blasting off with its 100,00 Volt attack, but in the process it accidently zaps Gomazou as well. Frightened, the little pokemon runs away until it reaches the campout where the just blasted away-Musashi-tachi are camping out. Nyasu is able to figure out that its tail can be used to entice Gomazou (just like it did with Buru), so a plan is concocted to use the cat pokemon's tail to trick Gomazou into attacking Pikachu. The plan works, and Pikachu and Gomazou are captured and thrown into a small cage. Pikachu and Gomazou, working together, manage to break their cage and escape to a river, where Satoshi is able to reunite with them. The Rocket-Dan battle them one more time, but the now trusting Gomazou takes care of them. Gomazou isn't afraid of Satoshi anymore, and the group continues on the road to Chouji City. I think this episode takes the record for most number of Rocket-Dan attacks in one episode. Sheesh, even Kojirou was getting annoyed with the whole thing, so much so that he stopped Musashi twice while she was trying to do the motto. Edit-wise...your standard Jouto League episode. Ho-hum. For some reason, this episode was listed as "Phanpy's Phantastic Arrival," but the title was changed for when the episode aired. 4Kids has been doing that a lot lately, and I wish I had an explanation for it. The music replacing has gotten really bad, and I think from now on we can just assume that 4Kids is going to replace all but about two pieces of background music per episode. I think it's interesting to note that it really is milk that Musashi-tachi are drinking in wine glasses. 4Kids didn't color any wine to be white, they didn't add any milk mustaches, nothing. Kinda amazing, huh? Don't panic, you didn't miss anything crucial. Really, you didn't. Here's what happens. Right after Pikachu and Phanpy break out of their cage, we see them running, see Jessie and James talk for a little bit in their balloon, and then see Pikachu and Phanpy stop at the river. That whole collection of scenes is about 23 seconds long. Well, right after Pikachu stops at the water, the Japanese version cut to commercial. When they return, those same 23 seconds of footage are played again. We see Pikachu and Gomazou running away again, we see Musashi and Kojirou talk for a bit in their balloon again, and we see Pikachu and Gomazou stop at the river again. Instead of replaying the same footage twice in a row (since their commercial break took place earlier in the episode), 4Kids just cut one of them out. I don't know if they cut the footage from before the commercial break or from after, because it really is the exact same footage. The only difference is that, in the Japanese version, they use different music for when they replay the scene (neither of which, by the way, were used in the dub).